The only Miyaguchi–Preneel MD hash I know is Whirlpool. I suppose there are likely others. Why do most MD hashes choose Davies–Meyer? If anything, Davies–Meyer relies on related-key resistance while Miyaguchi–Preneel relies on chosen-plaintext resistance. The former ought to be far more difficult to achieve. So I'm curious about the rationale. and deviating from that while possible (with padding) complicates security. So I guess the question is whether that the only reason? Performance? Flexibility? SHA2 may not be able to have variants (eg: 256, 512) as easily with Miyaguchi-Preneel. Davies–Meyer is one of the two simplest among the 12 secure methods by which a block cipher and XOR can be turned into an iterative hash with one encryption per block, per the analysis of Bart Preneel, René Govaerts, Joos Vandewalle's Hash functions based on block ciphers: a synthetic approach, in proceedings of Crypto 1993. Note: in the above table, the block cipher $E$ uses its first argument as key. Davies–Meyer (method 5) is the only of the 12 that works with a block cipher having a key of width different of its block without needing an adapter (the g in the first drawing of the question). When the key is wider than the block, that characteristic 2 makes Davies–Meyer use less encryptions for large messages, and that can translate into a speed advantage. 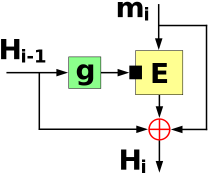 MD4, which was influential on MD5, then SHA, SHA-1 and SHA-2, essentially used Davies–Meyer (except for replacement of XOR with modular addition on a word). 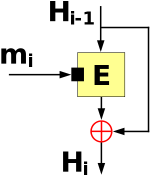 Davies-Meyer is likely the most widely employed compression function in any concrete hash proposal. 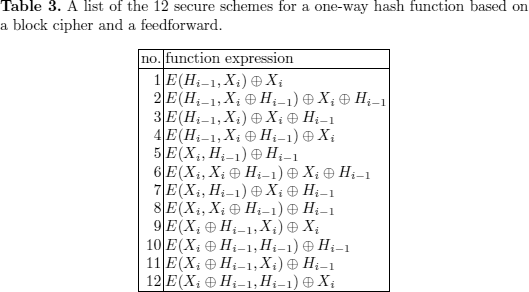 But more importantly, it is the only compression function among the 12 secure constructions analysed (in the context of a single-chain iterated hash function) by Black et al. [Black et al. 2002] that naturally allows the underlying block cipher to accept a key size different from the block size; all the remaining 11 functions XOR the key and the data block, thus forcing either truncation or padding to cope with the different sizes, and it is unclear to what extent truncation or padding might adversely affect the security analysis. Quantitatively, the Miyaguchi-Preneel scheme is slightly more secure (by a roughly constant factor) than Davies-Meyer, but this difference is offset by the extra flexibility in the choice of the block cipher structure, which allows for faster hashing with the use of double-length keys. Not the answer you're looking for? Browse other questions tagged hash merkle-damgaard compression-function miyaguchi-preneel or ask your own question. Why does the padding in Merkle–Damgård hash functions like MD5 contain the message length? Is the IV value in Davies Meyer construction public?